Yesteryear beautiful actress Sadhna passed away today on 25th December 2015. I have watched almost all her films on either television or on Youtube. She was among the top heroines of 60's who after retirement remained away from the media spotlight because she wanted to be remembered as young and beautiful. We can hardly recollect her looks in our memories any after 70's. During the period after 70’s when other heroines of 60’s started taking character roles of sister-in-laws (bhabhi) or mothers she took a backseat and spend her life in hiding. I was aware of her name in my childhood even before recognizing her by face due to discussions and references to 'Sadhna Cut' a hairstyle in which hair strands fall over forehead almost covering it. This style of female hairs became synonymous to her name and will remain so as always as a tribute to her. I read somewhere that a director suggested this style of a Hollywood actress of that time to her but I am sure most of us in India hardly knew who this Hollywood actress was.For her movies Mera Saya, Anita and Woh Kaun Thi she got the title of mystery girl as all these movies were suspense thriller. Sadhna was also blessed to have pictured in some of the melodies and evergreen songs of Indian cinema along with acting in some of the greatest hits of that time. 'Mera Saya',' Lag Ja Gale', Tera Mera Pyaar Amar', ' Jhumka Gira Re,' 'Mujhe Teri Mohabbat Ka Sahara', 'Abhi Na Jao Chodkar Ke Dil Abhi' these and many more songs comes alive in front of my eyes when I read or heard her name. Mera Saya, Hum Dono, Woh Kaun Thi, Arzoo, Mere Mehboob, Asli-Naqli are some of her memorable films. She was a beautiful, graceful and a great actor who graced the Indian screen in 60's. Everyone who is a die-hard fan of classic Indian cinema like me knows that a crucial part of Indian cinema has departed today from this world. But I am sure her beautiful Saya with compelling eyes will remain with us through her songs, her movies and an enchanting smile. Oh, so sad...reading about her demise. I agree with your views. 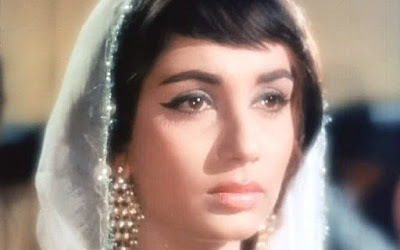 Sadhana was my favourite star. I read this article at five times.A star of her calibre have been very rare. May god rest her soul in peace.